You can take a look at h5py’s documentation to familiarize yourself with h5py.File. You can also use other HDF5 bindings to inspect DiffractionDataset instances. Create a DiffractionDataset from a collection of diffraction patterns and metadata. patterns (iterable of ndarray or ndarray) – Diffraction patterns. These should be in the same order as time_points. Note that the iterable can be a generator, in which case it will be consumed. filename (str or path-like) – Path to the assembled DiffractionDataset. time_points (array_like, shape (N,)) – Time-points of the diffraction patterns, in picoseconds. metadata (dict) – Valid keys are contained in DiffractionDataset.valid_metadata. valid_mask (ndarray or None, optional) – Boolean array that evaluates to True on valid pixels. This information is useful in cases where a beamblock is used. dtype (dtype or None, optional) – Patterns will be cast to dtype. If None (default), dtype will be set to the same data-type as the first pattern in patterns. ckwargs (dict, optional) – HDF5 compression keyword arguments. Refer to h5py’s documentation for details. Default is to use the lzf compression pipeline. callback (callable or None, optional) – Callable that takes an int between 0 and 99. This can be used for progress update when patterns is a generator and involves large computations. kwargs – Keywords are passed to h5py.File constructor. Default is file-mode ‘x’, which raises error if file already exists. Default libver is ‘latest’. The required metadata that must be passed to DiffractionDataset.from_collection() is also listed in DiffractionDataset.valid_metadata. Metadata not listed in DiffractionDataset.valid_metadata will be ignored. Create a DiffractionDataset from a subclass of AbstractRawDataset. raw (AbstractRawDataset instance) – Raw dataset instance. exclude_scans (iterable of ints or None, optional) – Scans to exclude from the processing. Default is to include all scans. processes (int or None, optional) – Number of Processes to spawn for processing. Default is number of available CPU cores. callback (callable or None, optional) – Callable that takes an int between 0 and 99. This can be used for progress update. align (bool, optional) – If True (default), raw images will be aligned on a per-scan basis. normalize (bool, optional) – If True, images within a scan are normalized to the same integrated diffracted intensity. ckwargs (dict or None, optional) – HDF5 compression keyword arguments. Refer to h5py’s documentation for details. kwargs – Keywords are passed to h5py.File constructor. Default is file-mode ‘x’, which raises error if file already exists. open raw datasets by guessing the appropriate format based on available plug-ins. IOError : If the filename is already associated with a file. The following three methods are the bread-and-butter of interacting with data. See the API section for a complete description. Returns diffraction data at a specific time-delay. timdelay (float or None) – Timedelay [ps]. If None, the entire block is returned. relative (bool, optional) – If True, data is returned relative to the average of all diffraction patterns before photoexcitation. out (ndarray or None, optional) – If an out ndarray is provided, h5py can avoid making intermediate copies. arr – Time-delay data. If out is provided, arr is a view into out. ValueError – If timedelay does not exist. Returns the averaged diffraction pattern for all times before photoexcitation. In case no data is available before photoexcitation, an array of zeros is returned. The result of this function is cached to minimize overhead. Time-zero can be adjusted using the shift_time_zero method. Integrated intensity over time inside bounds. For polycrystalline data, we can define more data structures and methods. 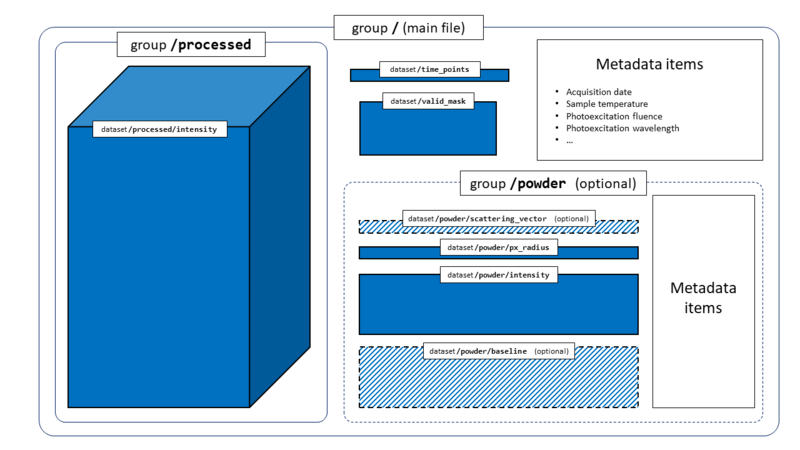 A PowderDiffractionDataset is a strict subclass of a DiffractionDataset, and hence all methods previously described are also available. The following methods are specific to polycrystalline diffraction data. See the API section for a complete description. Returns the average powder diffraction pattern for all times before photoexcitation. In case no data is available before photoexcitation, an array of zeros is returned. bgr (bool) – If True, background is removed. Returns the angular average data from scan-averaged diffraction patterns. timdelay (float or None) – Time-delay [ps]. If None, the entire block is returned. bgr (bool, optional) – If True, background is removed. Determine the scattering vector q corresponding to a polycrystalline diffraction pattern and a known crystal structure. For best results, multiple peaks (and corresponding Miller indices) should be provided; the absolute minimum is two. crystal (skued.Crystal instance) – Crystal that gave rise to the diffraction data. peak_indices (n-tuple of ints) – Array index location of diffraction peaks. For best results, peaks should be well-separated. More than two peaks can be used. ValueError : if the number of peak indices does not match the number of Miller indices. ValueError : if the number of peaks given is lower than two. Compute and save the baseline computed based on the dual-tree complex wavelet transform. All keyword arguments are passed to scikit-ued’s baseline_dt function. wavelet (str, optional) – Wavelet to use in stages > 1. Must be appropriate for the dual-tree complex wavelet transform. See skued.available_dt_filters() for possible values. level (int or None, optional) – If None (default), maximum level is used. DiffractionDataset instances (and by extension, PowderDiffractionDataset instances) are a specialization of HDF5 files. Therefore, it is possible to inspect and manipulate instances with any other tool that has bindings to the HDF5 libraries. The HDF5 layout is presented below.